Hello there! 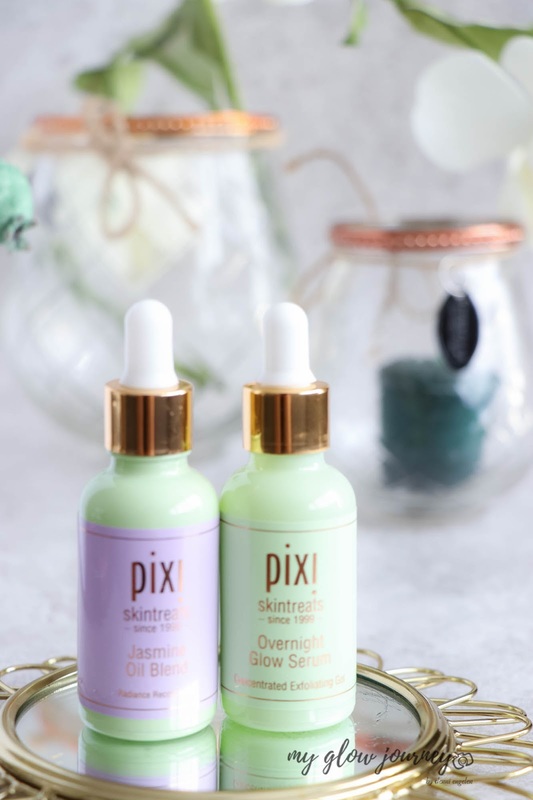 Glad to have you here on the blog, today I'm going to tell you about my favorite Pixi skin treats. If in the past I was talking about their gorgeous makeup well they also have amazingly great skincare, and today I'm going to show you my four favorites! I have more favorites from the brand, like the makeup fixing mist, hands down the best out there and the iconic Pixi&Caroline Hirons double cleanse. Enriched with 13 natural oils fruit extracts Aloe Vera and propolis this mist promises to shootee hydrates and nourishes the skin beautifully giving that so much sought-after glow. And for me, the claims of this facial mist “Gives a glowing, luminous and smooth complexion “where meet and exceeded. I like.., no I love the glow and dewiness Pixi glow mist gives to my face! Having a refreshed nourished healthy & glowy face every day is addictive, and I don’t see myself stopping using this spray anytime soon. Also, the spray quality of Pixi glow mist is actually fantastic! The mist is lovely and with one spray covers a lot of areas. 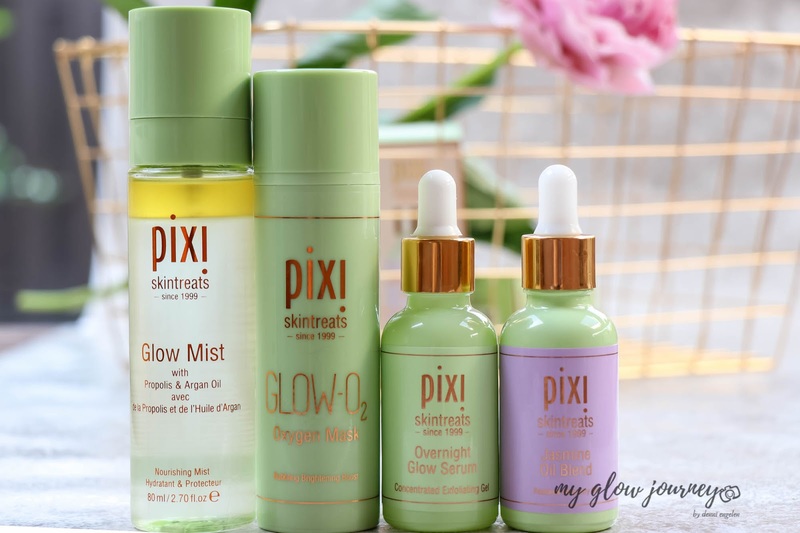 So many facial sprays will just spit at you and drip down your face ruining the makeup and I'm happy to report that is not the case with Pixi glow mist. Glow O2 Oxygen Mask as the name say is a two minutes treatment mask with an instant anti-fatigue effect meant to revive tired and dull skin. I used this mask about 3 or 4 times since I have it, every time in the evening before going out. Not sure how to name this routine, because is neither am or pm, is taking the day off to just put the glam look on. After rinsing the mask off my face my skin felt clean and luminous, my pores appeared smaller, and I got a pretty glowyness to my skin. Facial in a bottle (with a pump !!) if I may say so. After the mask, I continued with my regular routine hydration mist, serums, moisturizer, etc. It comes with a pump! Finally! I don’t know about others, but I'm ready for this minimalistic trend with the glass dropper and open jars to come to an end and the products to come in a pump dispenser. So just for the pump part, this product gets extra points for me. Also, the pumps work beautifully, and you don't get product squirted weirdly everywhere. Thank you for that Pixi Beauty. Outstanding! Besides the excellent packaging, my experience with Glow O2 Oxygen Mask is nothing short of amazing. My skin felt glowy and luminous after each use, and the makeup applied beautifully after. Well designed, exquisite texture and super easy to use when you don’t have a lot of time to invest in letting a face mask set. This is the first mask I try to form the brand and to be honest I want to try them all now. I can't even believe this is drugstore because the quality is high end. 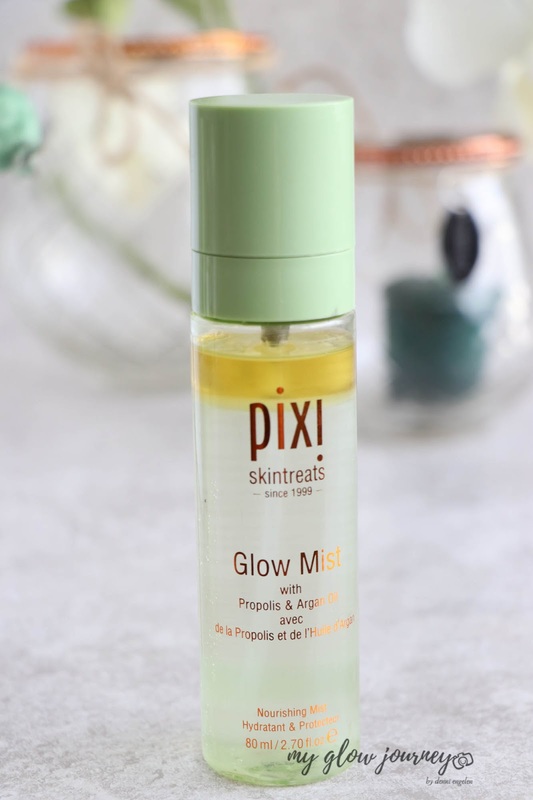 Part of the skin-treats family Pixi Overnight Glow Serum is a glycolic and arginine exfoliator that promises to reduce the appearance of fine lines and fade the sun spots while revealing a smooth and bright complexion. I used this serum in my PM routine after (double) cleanse and before my other products. Used with using water consistency acids not going to lie I did not like this at first. Thick in consistency and tacky when applied to the skin I felt no tingling at all ( my skin is used with heavier acids ) but after continuing with my other products the tackiness of it went away. Basically, I had not high expectation after the first use, but to my surprise, my skin felt plump and radiant the second day. So I kept on using it, I'm on day 12 and counting. 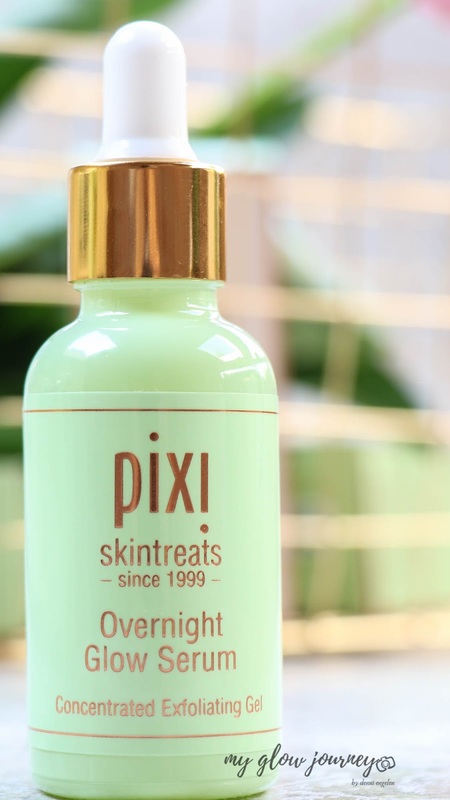 Pixi overnight glow serum is gorgeous, the consistency of it is a taste to be acquired, but the juice is fantastic. I apply few drops of it on my face after cleansing and toning and before my other serums and moisturizer. With ingredients like Glycolic Acid Ascorbic Acid (Vitamin C) Retinyl Palmitate (Vitamin A) Tocopheryl Acetate (Vitamin E) I can feel the brightening and anti-aging effect of it I have dry skin and this serum works beautifully with my skincare regimen. It indeed is aptly named, my skin is so incredibly soft and glowy the morning after wearing this! My only complaint with Pixi Overnight Glow Serum is that the dropper dispenser is not great and makes no justice to the product. I would love to see it in a pump dispenser because the serum is too thick to use the dropper as effectively as I would like. This is totally going to be off-topic, but in my young years, I always dreamed about the day I will have my own house and how I'm going to have my reading corner in the, and there will be a lot of jasmine and roses. Years go by, and the reading corner dream got pushed back into the long forgotten to do list of my brain and long story short I still don’t quite have that corner, I'm hoping next year when I will redo the garden I will make it happen. I'm currently designing it in the bits of time i have. Now you know what I feel every time I open this bottle. But let's get back to the Jasmine Oil Blend because gods know I can jabber a lot. 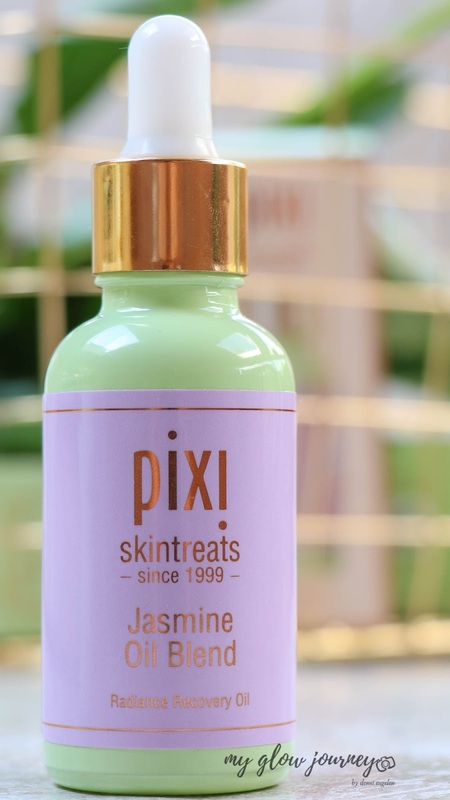 Pixi’s Jasmine Oil Blend is as the name says a blend of oils containing jasmine flower extract, grape-seed oil, and evening primrose and is rich in omega 6, vitamin c and antioxidants. It can be used alone or mixed with moisturizer, and I even tried to thin my foundation with it, and it worked beautifully. The product is scented, smells like jasmine flowers and it does linger quite a bit. While I usually don’t like scented stuff this particular scent, I love, and I did not experience any problems regarding skin sensitivity. Its delicate, feminine, light jasmine scent was the first thing I liked about and its eye-pleasing packaging, but once I applied a few drops of it, it felt like rubbing cashmere on my face. Smooth and delicate made me not only look good but feel good at the same time. In the evenings I apply this instead of a moisturizer and in the am I mix it with my moisturizer. which one of these beauties will you pick up? I have never heard of this brand before but loving the packages! 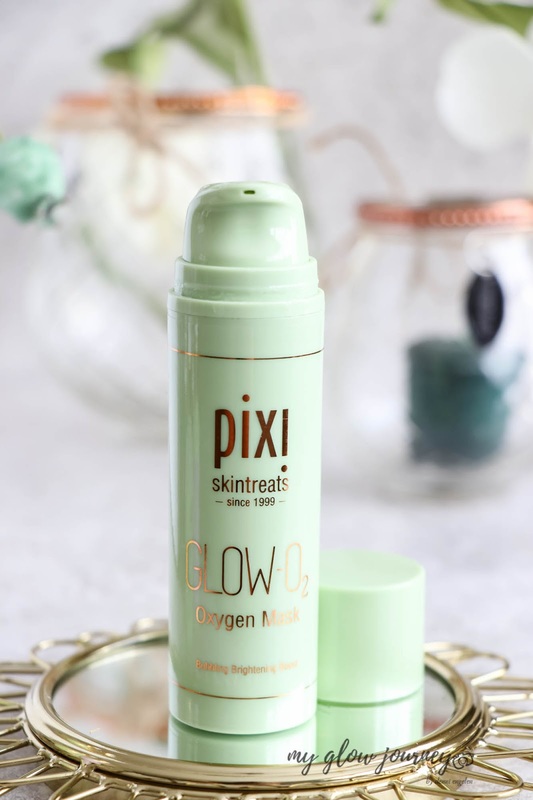 Would love to try the Pixi Glow O2 Oxygen Mask! I've been hearing so much about Pixi products lately! I think it's awesome that you're sharing what works for you and why you like them. I appreciate that! I love Pixi because they are cruelty free. And I can also attest that the Pixi mist is great as well, as is the glow tonic too. My skin needs rejuvenation at the moment as well. The packaging of all these products is so pretty and eye catching . I have not come across any of these but I really like the sound of the mist and can see my self using it. Pixi products have excellent composition. Argan Oil and propolis are excellent both for our skin and for overall health. Especially, these products are without parabens. I would definitely opt for the Glow Mist! I am not familiar with these product, but Id like the overnight serum. I can not believe that I do not own an Pixi products. I hear such good things and the packaging always looks great. Those bottles and the packaging looks great. I like that fact that aren't tested on animals. That's a good thing. Nice products! I would like to try the oxygen mask and glow mist. Really interesting. I wonder if they will work in humid weather. I've heard such great things about Pixi! I definitely want to try the oxygen mask. My skin could sure use it! Lovely post, sounds like a good beauty line. I would opt for the "Glow O2 Oxygen Mask", i love how supple and refreshed my skin feels after a facial mask.